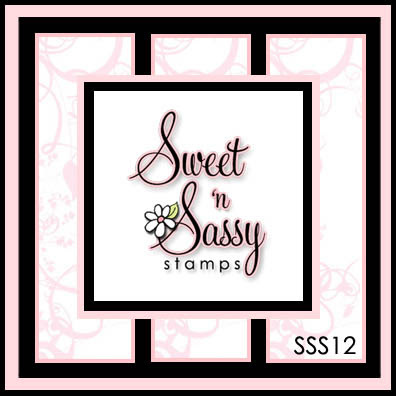 Welcome to the SWEET 'n SASSY STAMPS Blog Hop, featuring cards made with a little bit of the WILD SIDE from the Sweet 'n Sassy Stamps. Did you start at Korin's Blog? If you came from Leah's Blog you're in the right spot. The reason I asked if you started at the Korin's blog, is because you'll want to be sure to start at the beginning and hop through all the Sweet 'n Sassy Stamps Designers Blogs and follow through on the Blog Hop tomorrow becuase Korin has a SURPRISE for someone at the end! Now on to my card...To create my background I used the Simple Whitewash from the August Technique Junkies Newsletter. 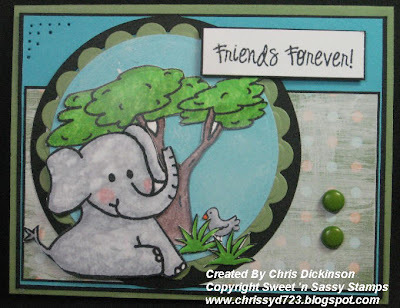 The Elephant image is from Sweet 'n Sassy Stamps Ellie and Friends stamp set. Other - Nestibilities, Gesso, Brush, Basic Grey Brads, Paper Piercing Tool, Copics, Dimensionals, Paper Snips. 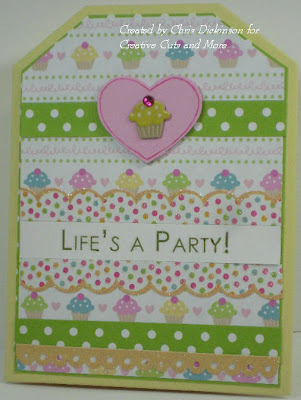 I want to remind you that today is the Sweet 'n Sassy Stamps Blog Hop! 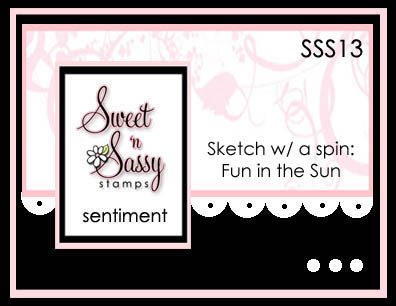 Come join the fun and take a WALK ON THE WILD SIDE with the Sweet 'n Sassy Stamps Design Team Blog Hop! Come back tomorrow for a creation! Have a great day! In the process of going from Blog to Blog you will want to collect small treasures! At the end of the treasure hunt, put the collection together to see what it says and follow Pat’s directions to win a FABULOUS treasure! This project gives you a SNEAK PEEK to the Technique "TEXTURED SPECTRUM". The technique instructions will be available in the upcoming Technique Junkies Newsletter! If you are not a subscriber, I really must encourage to become one! Each newsletter is better and better with step by step directions (with pictures!) on how to use these WONDERFUL techniques! 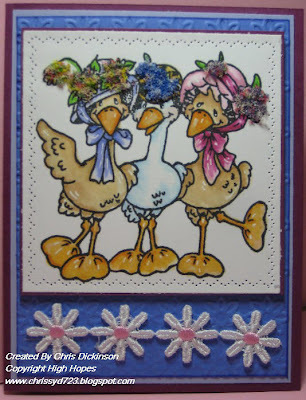 Stamp Set: Simple Friendship available at Stampin' Up! The treasure you will find here is the letter "G". For your next CLUE to the TREASURE go to Beth's Blog to collect the rest! Have fun hunting for your treasure! Hello! Happy Saturday! Today will be a busy day. I am celebrating my big 4-0 birthday this weekend with my family! It will eb lots of FUN! 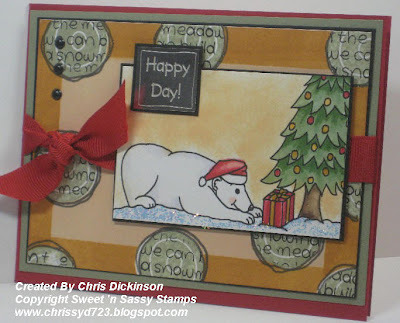 Todays card is using the SWEET STOP SKETCH and the BLOGGERS CHALLENGE card - the theme for the Bloggers Challenge this week is to celebrate Christmas in July. Check out the other Blogger Challenge participants HERE. They always inspire me! On Monday, we will be having a FABULOUS TREASURE HUNT and Pat from Technique Junkies will have a prize of being a Technique Junkie for life! Check out the details HERE. I will see you back on Monday! Thanks for stopping by! Have a great weekend!!! Hello! Are you all enjoying your summer? Ours seems so busy these days. On Tuesdays, I host a class in my home for a group of moms for the Institute For the Excellence in Writing. We are doing a co-op this school year for a writing class for our children and we are learning what they will be learning next year, so we can better train them. It is a lot of hard work! There is even homework! Add to that play dates, running errands, housework, park dates with friends, visitin family, and every day is packed with activity! 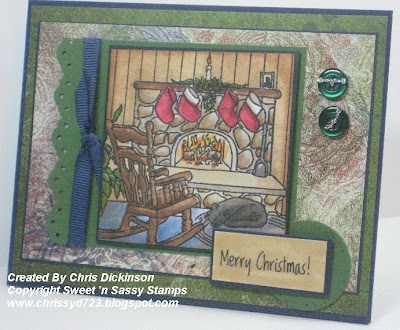 Todays card celebrates SWEET 'n SASSY STAMPS Christmas in July Celebration - check out their FABULOUS sale! You will even have a chance to get this adorable image! The technique on this card comes from TECHNIQUE JUNKIES and is called Scrappy Spots. It was SO fun to create and I love how it turned out! 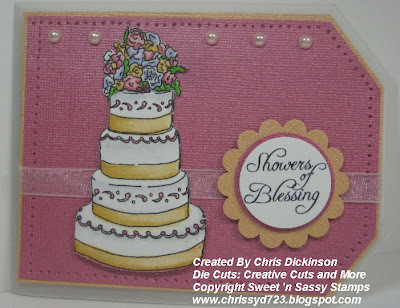 This week's Belli Challenge is to use metal tags on your cards or projects. You don't have metal tags? No problem! Make a faux metal tag, use metal hardware, use a metal edge tag, or even a metal charm. You can make a faux metal tag in several different ways. Paint a chipboard tag with metal paint, emboss some cardstock with metal embossing powder, or you could even use metal cardstock (silver, gold, copper, etc...) shaped like a tag. Hello! I hope this finds you ready for a new week! After several weeks of travel my dear husband was home, so it was so nice to spend time with him and our children. I think my kids ate it up too. He is more the type to work steadily and get everything done, where I just wanted to sit and be with him. This week, Creative Cuts and More is sponsoring the Caardvarks Challenge! 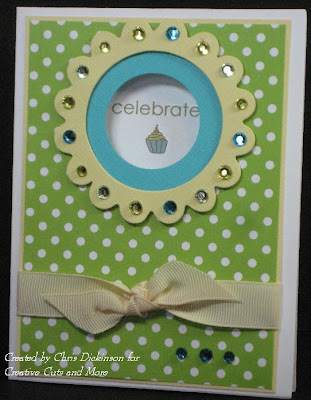 Create a ***NEW*** baby or bridal shower card or altered item! There are MANY gorgeous samples on the Caardvarks website of Wedding and Baby gift ideas. I made this card with the Tag Card With Two Tags, Bottom Opening . Accessories: Scallop Punch, Circle punch, Copics, Pearl Adhesive, Paper Piercing, mat Pack., organdy ribbon. Creative Cuts & More will help you achieve all your paper crafting endeavors. Whether you are a stamper, scrapbooker or card maker, let us help you create wonderful stamped projects, great scrapbook layouts, and greeting cards. We'll save you a ton of time with our die cuts! We carry Die Cut Alphabets, Tags, Shapes, unique Die Cut Cards with all styles of window openings, and our most popular selection, Die Cut Bags and Boxes. All of our products are able to be purchased as a single selection or you can receive a discount for bulk orders. We offer our die cuts in many materials such as all colors of Bazzill Smoothies, Bazzill Criss Cross, plus 82 colors of Bazzill Canvas Texture. In addition, we also offer all our die cuts in 35 metallic and pearlescent colors, as well as chipboard, felt, foam, and polyshrink. We also sell both Bazzill and metallic cardstock by the sheet!Are you in need of some great ideas or samples? Be sure to visit our Artwork Gallery for some great creative ideas that have been made using some of our products. I am so excited to announce that Technique Junkies will be having its very first TREASURE HUNT! The Treasure Hunt will begin on Monday, July 27th at the Technique Junkies Blog early in the morning. This will happen the fourth Monday of every month! You will want to follow the links from there and gather some "treasures" along the way. When you arrive at the FINAL STOP, directions will be given for you to follow for your chance to win a FABULOUS PRIZE from Pat Huntoon! Hello! Today is Sweet Stop Saturday. The third Saturday of every month there is a sketch with a TWIST! 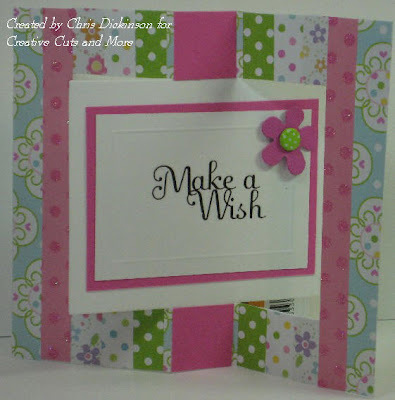 This week's Twist is to make a card FUN IN THE SUN. While this card isn't necessarily FUN IN THE SUN - I can't help but think of the SHOWERS OF BLESSINGS raining down upon us. This little girl dancing as GOD rains down the blessings upon her. I pray that for you today! We have had a busy summer so fun and today will prove to be another busy day. We are going to visit my grandmother and my husband returns home after being out of town this week. I am so glad! Maybe tomorrow I can sleep in? LOL Either way, I will have ANOTHER Sweet Stop Sketch for you, as Saturday there is a NEW Sketch! This week's sketch over at The Sweet Stop is so FUN and EASY! Please join us and play. You do not need to have SNSS stamps to participate... but if you don't have any, then what are you waiting for? A sale? Well, we've got that, too! 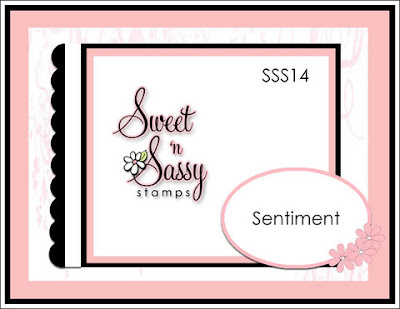 Be sure to check the Sweet 'n Sassy Stamps website for details on the Christmas in July special offer, which includes exclusive gift(s) with purchase!!! This week's Bloggers Challenge is to create a project using STITCHING. Well, as much as I love how the sewing looks at cards, I am not a big sew-er, so I used the All in a Row stamp that has been retired SU. You will want to gather some more inspiration from the other players - you can find their links HERE. Thank you so much for stopping by! I hope you have a blessed day! Hello! 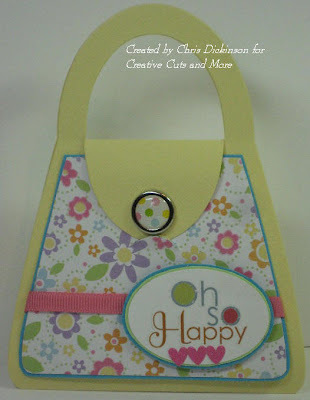 Today is the Christian Paper Crafts Magazine New to You Challenge that I host every Wednesday! 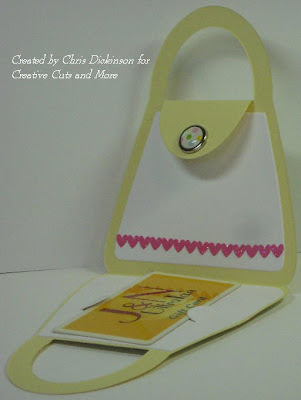 This week's Challenge is to create a card using the Crimped Envelope Pocket Card. 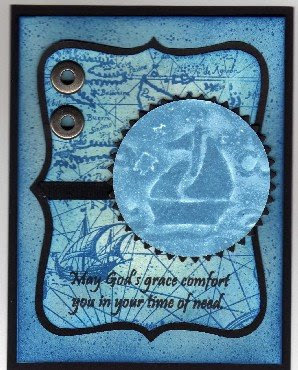 I used the tutorial HERE from Splitcoast Stampers. This week, we have been busy with Tae Kwon Do practice. My kids are preparing for their first belt test and they are very excited! Between that and catching up with housework from being gone last week, life has been busy! 1-2 One day long ago, God's Word came to Jonah, Amittai's son: "Up on your feet and on your way to the big city of Nineveh! Preach to them. They're in a bad way and I can't ignore it any longer." 3 But Jonah got up and went the other direction to Tarshish, running away from God. He went down to the port of Joppa and found a ship headed for Tarshish. He paid the fare and went on board, joining those going to Tarshish—as far away from God as he could get. After hearing Pastor Sam Jackson speak this week, I was challenged to ask myself and really think about what GOD is calling me in? Where or what have I been neglecting or running in the other direct from? My children have me so distracted right now, that I seem to be tending to the immediate needs and have a hard time thinking past what is beyond that. I am hoping this week to really have some treasured moments to really focus on where God has been calling me and where I may not be going in the directions HE wants me too. If you would like to listen to this message, I encourage you to go to www.graceinracine.com and download it to your computer or any other means of listening devices. 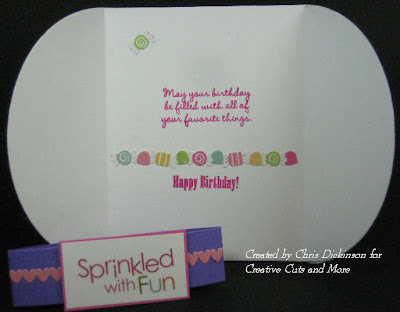 Creative Cuts and More BLOG HOP! 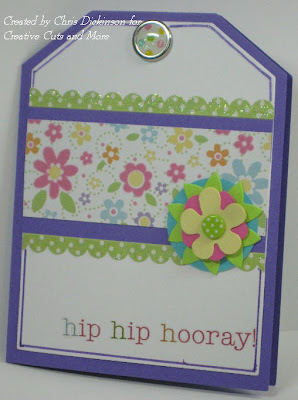 This is my FIRST blog Hop with Creative Cuts and More! I am so excited to have been asked to join their Design Team! 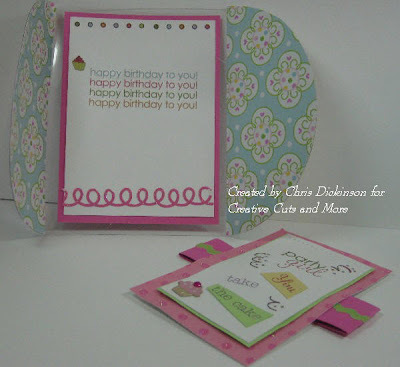 Creative Cuts and More is offering blog candy at the main Die Cut Diva blog and also on one other link in the chain, so you will want to keep hopping through the blogs Two of the brand new card kits will be given away!!! How fabulous is that!? Now for your "Eye Candy here" ;) Here are pictures of the TWO KITS available at Creative Cuts and More... You can find the kits HERE. Both of these DELIGHTFULLY FUN kits were designed by Pam Smerker. This GIRL card kit was the one I used for all of my cards. I have to say, this was SOOO much fun! I do not think I have had this much fun playing with cardstock in the past few months! It was just SHEER JOY to create these cards with this kit! The kit had everything I needed, but I couldn't resist adding a few things. Those things will be listed per card for you, so you know what won't be included in the kit when you purchase or win it! Watch for many more new and exciting kits and products from CC&M. and the Scallop edged punch. 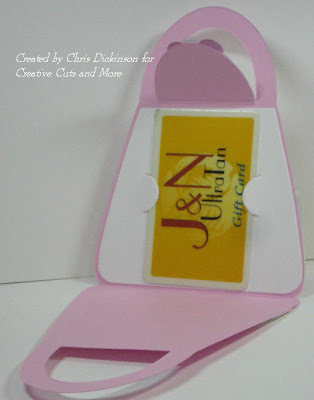 Everything including the Gift Card holder insert which is exclusively designed by Creative Cuts and More is included! This is a Side Opening Tag Card. I used a Pink Marker to frame the heart, this was not included in your kit! For this Side Opening Tag Card (included in the kit) the only addition that I used was the Copic Spica Purple Pens, SU Tempting Turqouise cardstock and a 1 1/2 inch circle punch. For this Flip Flop card (included in the kit) I used a Bone Folder for the extra scoring on the white layer, Glue Dot to attach the flower. I cut the designer paper strips in 1/2 inch strips and 1/8 inch strips. 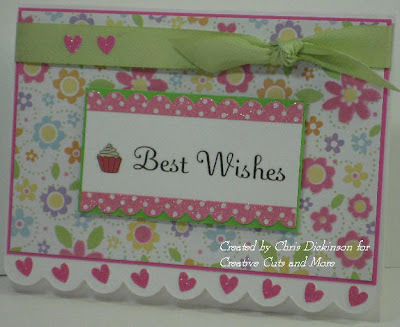 I loved this because the flip flop card is precut and scored for me, so all I had to do is decorate these cards! 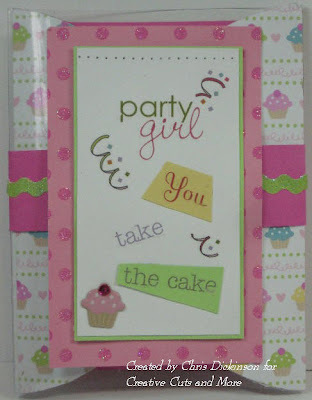 The top portion that says "Party Girl, You take the cake - slides off. 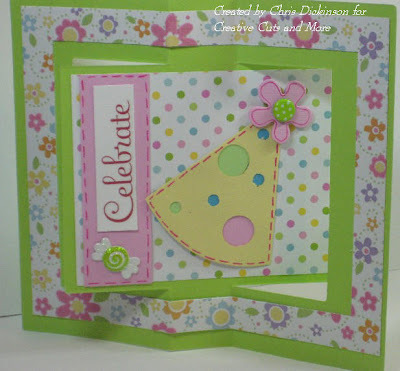 Additions not included in the kit is the layers - SU Gable Green and Pink Passion Cardstock. I also Paper pierced the top postion of the outside layer. Out of this kit, this was the quickest card I created. Once I was on a roll there was no stopping me! Additions were Su Pink Passion, Green Galore Cardstock and the Celery Ribbon Out of all of the cards...this one is my favorite! Do you know what makes it my favorite? The Black Cardstock. 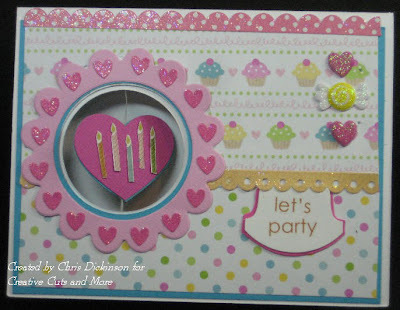 I used it for the layers -and a 1 1/2" circle punch for a layer behind the heart, Stardust Stickles was used on the HAPPY. Creative Cuts and More is offering a special for ONE WEEK ONLY! There is a coupon code for 15% off on your purchase. The coupon code is birthdaydt0915. Enjoy your shopping spree! From here you want to go see Angie's Blog to see her wonderful creation! Be prepared to be WOWed by all of the Design Team members. BLOG HOP WITH A CHANCE TO WIN! There will as always be a chance for one or two lucky people to win a great prize!! Come join the fun! The birthday kit is FABULOUS!!! Home from Niagara Falls with pictures! This week I was blessed with the opportunity to go visit my friend Janette in Buffalo, New York. The kids and I made a long road trip to visit her on Monday and did several FUN things while there. Monday, we drove all day (10 1/2 hours) to her house. Tuesday we rested. Wednesday we went to the Buffalo Zoo and Thursday God blessed us with FABULOUS weather and we went to see the Niagara Falls. Below are some videos of Niagara Falls that I took with my camera and also some photographs too! I will be back with regular posts some time in the next day or so! 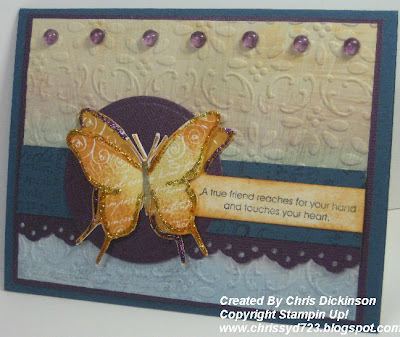 This week's Belli Challenge is to use texture on your cards or projects. What kind of texture? Anything that you can "feel" on your card - Magic Mesh, flocking, Flower Soft, velvet, or even hammered metal. 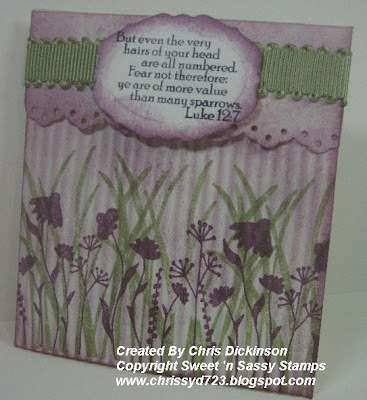 Look around in your stash of stamping stuff, and I'm sure you will find something you can use. 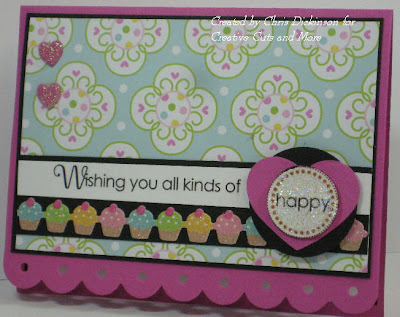 Here is my card, my friend Janette is on the Design Team for HIGH HOPES, so I played with some of her stamps. I bought some flower soft and played a bit with it too. 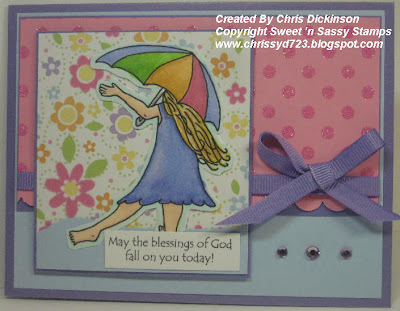 Sweet 'n Sassy Stamps is proud to be sponsoring the CPS sketch challenge blog again this week. Tami cooked up another fabulous sketch that we've really enjoyed using! 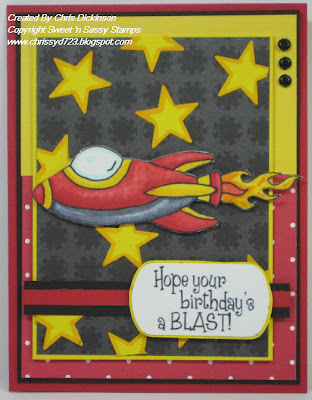 This adorable ROCKET is a Digital stamp from Sweet 'n Sassy Stamps! 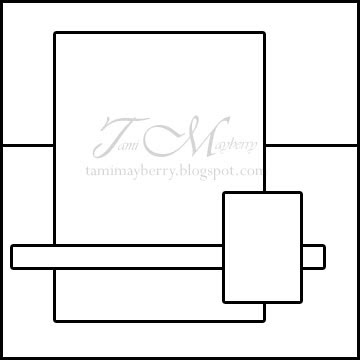 Visit our DT blogs for more inspiration using this fun sketch! I hope you had a FABULOUS Fourth of July! We had a great weekend. Today, I will be in the van the entire day! I am driving from Wisconsin to Buffalo, New York with my children to see my friend Janette! I am so excited to go see her. While we are there we will be going to Niagra Falls. I will continue to have some posts and will share some pictures too! 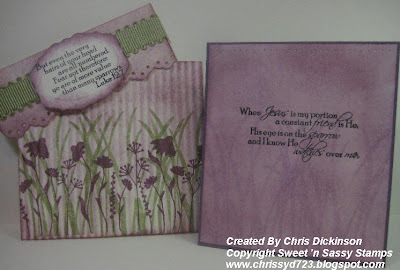 This card uses TECHNIQUE JUNKIES technique from the June/July newsletter called Stamped Stencil. Technique: Stencil Stamping - the sailboat was a stencil, not a stamp! 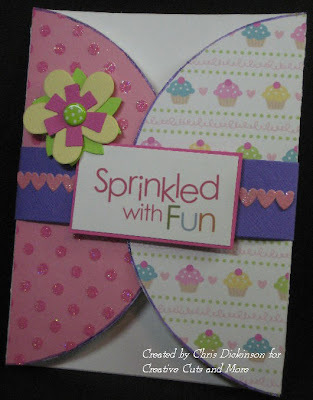 DAY 3 BLOG HOP - SPLATTER!!! BLOG HOP DAY 2 & A TREAT!